How much do other local communities pay towards their library? The table above features numbers provided by the Mohawk Valley Library System of 2013 budgets of local libraries. Population is based on census information and is the number of residents in the library district. The Local Public Funds Field is money that libraries receive either via direct support of local government, or is levied from taxpayers via a library tax. 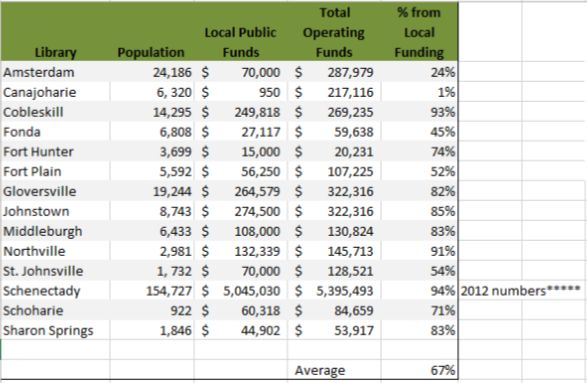 % from Local Funding is what percentage of that library's total budget is from local taxes. The average library in the Mohawk Valley Library System receives about 67% of it's budget from taxpayers. The Canajoharie Library's local taxes make up less than 1% of our annual budget.